Black knot of plums and cherries is a widespread and serious disease throughout the United States. Black knot is a common disease in Ohio on wild plums and cherries and in home orchards where pruning and spraying are not regularly practiced. Figure 1. Hard, black galls caused by the black rot fungus on plum twigs. The disease becomes progressively worse during each growing season and unless effective control measures are taken, it can stunt or kill the tree. The black knot fungus can infect American, European, and Japanese varieties of cultivated plums and prunes. Sweet, tart and Mahaleb cherries are also affected by the fungus, but are generally less susceptible than plum or prune. Occasionally, it may also infect apricots, peaches and other Prunus species. The black knot fungus mainly affects twigs, branches and fruit spurs. Occasionally, trunks may also become diseased. Usually, infections originate on the youngest growth. On infected plant parts, abnormal growth of bark and wood tissues produce small, light-brown swellings that eventually rupture as they enlarge. In late spring, the rapidly growing young knots have a soft (pulpy) texture and become covered with a velvety, olive-green growth of the fungus. In summer, the young knots turn darker and elongate. By fall, they become hard, brittle, rough and black. During the following growing season, the knots enlarge and gradually encircle the twig or branch. The cylindrical or spindle-shaped knots may vary from one-half inch to a foot or more in length and up to 2 inches in diameter. Small knots may emerge from larger knots forming extensive galls. After the second year, the black knot fungus usually dies and the gall is invaded by secondary fungi that give old knots a white or pinkish color during the summer. Smaller twigs usually die within a year after being infected. Larger branches may live for several years before being girdled and killed by the fungus. The entire tree may gradually weaken and die if the severity of the disease increases and effective control measures are not taken. Black knot is caused by the fungus Apiosporina morbosa. The fungus overwinters in knots on twigs and branches or in the infected wood immediately surrounding them. In the spring, the fungus produces spores (ascospores) in sacs (asci) contained within tiny fruiting bodies on the surface of the knots. These ascospores are ejected into the air during rainy periods and are blown for moderate distances by wind currents. Only succulent green twigs of the current season’s growth are susceptible to infection. Ascospores that land on them may germinate and cause infection if the twigs remain wet for a sufficient length of time. Normal growth is disrupted in the infected regions, and a knot is formed as the fungus causes the plant to produce tumorlike growths. Knots may become visible by the late summer of the year of infection but often are not noticed until the following spring, when they begin to enlarge rapidly. New ascospores capable of spreading the disease may be formed in the young knots the year following infection but often are not formed until the second spring. The fungus continues to grow in infected wood during the spring and fall months, causing the knots to elongate several inches each year and eventually girdle affected twigs and branches. Ascospores are potentially available from the time of bud break until terminal shoot growth stops, but the greatest number appear to be released during the period between white bud and shuck split. Although the precise environmental conditions required for infection are uncertain, only a few hours of rain apparently are required at temperatures above 55 degrees F (13 degrees C), whereas much longer rainy periods are required to produce infection at temperatures below this threshold. Most plum varieties grown in Ohio, including Stanley and Damson, are susceptible to this disease. It has been reported that Early Italian, Brodshaw, Fallenburg, Methley and Milton are somewhat less susceptible than Stanley; Shiro, Santa Rose, and Formosa are much less susceptible; and President is apparently resistant to black knot. Japanese varieties of plums are generally less susceptible than most American varieties. When planting new plum or prune trees, avoid planting trees next to or downwind from an old or abandoned orchard with a significant black knot problem. Similarly, remove all wild plum and cherry trees (potential disease reservoirs) from fence rows or woodlands next to the orchard site. 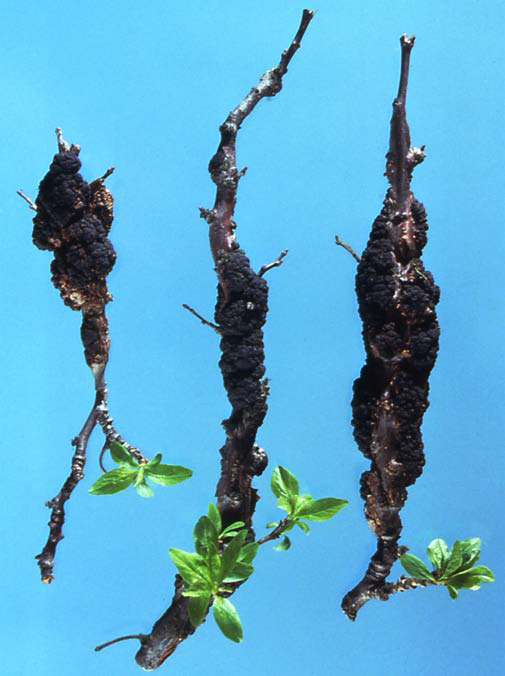 Established orchards or backyard trees should be scouted or examined each year for the presence of black knot, and infected twigs should be pruned out and destroyed or removed before bud break. Chopping prunings with a flail mower (to strip infected bark and knots from wood) is an alternative method of destroying infected prunings if burning or burying is impractical. It is important to prune at least 2 to 4 inches (5 to 10 cm) below each knot because the fungus grows beyond the edge of the knot itself. If pruning is not possible because knots are present on major scaffold limbs or the trunk, they can be removed by cutting away the diseased tissue down to healthy wood and out at least ½ inch (1 cm) beyond the edge of the knot. Fungicides can offer significant protection against black knot, but are unlikely to be effective if pruning and sanitation are ignored. The timing of fungicide sprays should be adjusted to account for inoculum levels and weather conditions. Where inoculum is high because of an established black knot problem or a neighboring abandoned orchard, protection may be needed from bud break until early summer. Where inoculum has been maintained at low to moderate levels, sprays are most likely to be useful from white bud through shuck split (the period of maximum availability of ascospores). Fungicides are most necessary and will provide the greatest benefit if applied before rainy periods, particularly when temperatures are greater than 55 degrees F (13 degrees C). In evaluating control programs, remember that knots often do not become apparent until the year following infection. Figure 2. 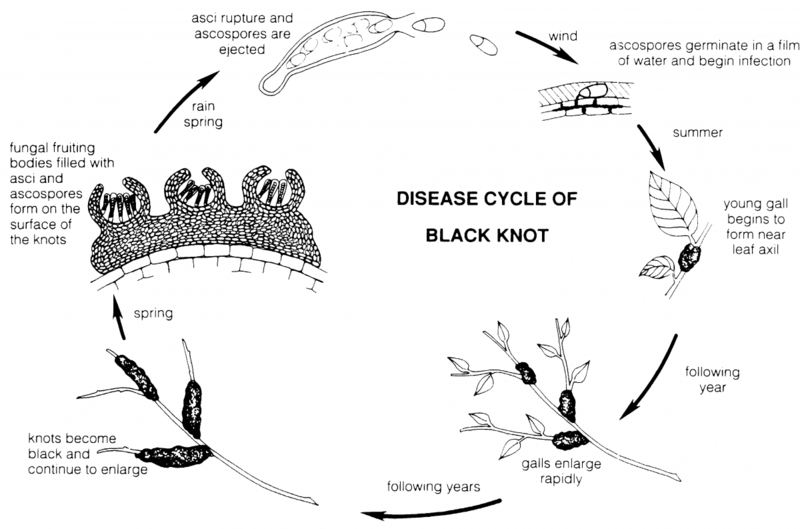 Black knot disease cycle. We want to thank the New York State Agricultural Experiment Station for use of this figure. Taken from Tree Fruit IPM Disease Identification Sheet No. 6.